Welcome to the KKSongs Music Center. This portion of KKSongs.org is devoted to studying, learning, and applying Indian music in a spiritual perspective. North Indian Music contains educational information about the North Indian (Hindustani) musical system. South Indian Music contains educational information about the South Indian (Carnatic) musical system. Gallery of Instruments is an interactive page contains pictures, brief descriptions, and a sound clip of the many instruments. - Khol Lessons is an extension off of the Instrumental Guides page on teaching khol. - Harmonium Lessons A: Teaches introductory harmonium. 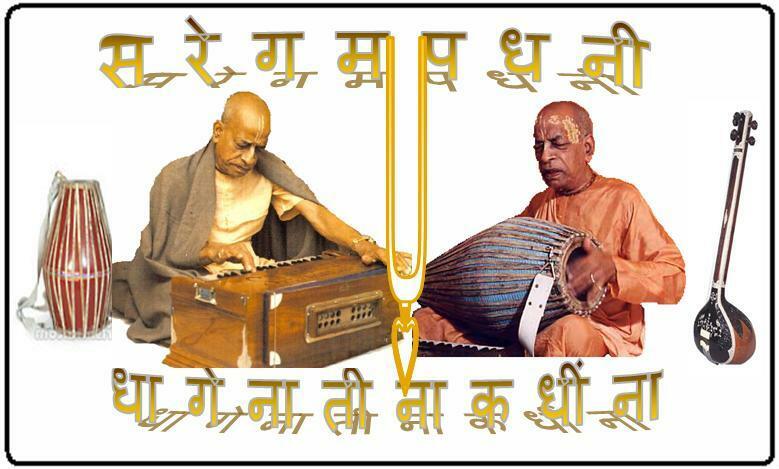 - Harmonium Lessons B: (Notations of the Vaisnava Songs) This has harmonium notation of well known Hare Krishna bhajans and kirtans. Ragamala is a database which contains detailed information and sound clips for ragas of the North Indian system. Talamala are databases which contain information, pictures, and sound clips for talas of the North Indian system.